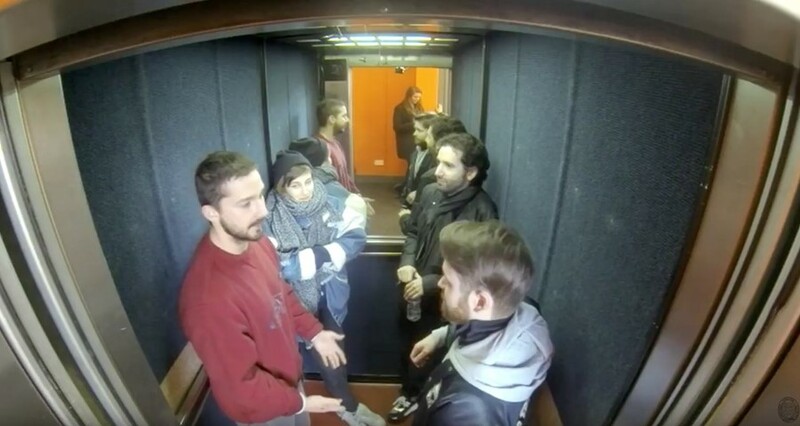 For most people the thought of getting trapped in a lift for 24 hours is their idea of hell – although being in there with Shia LaBeouf would probably be a sweetener. As part of his latest performance art project, LaBeouf, along with long-time collaborators Nastja Rönkkö and Luke Turner, will be spending 24 hours in an Oxford University lift. Throughout the project, visitors will be able to enter the lift to chat about whatever they want with the trio, while the world watches online. The project comes ahead of LaBeouf’s forthcoming speech at the Oxford Union, the university’s globally renowned debating society. If you’re based in Oxford and want to head down, Shia will be in the lift from now until tomorrow morning at 9am, although he’ll be leaving at 8pm to deliver his speech, before returning (hopefully he’ll fit a bathroom break in there too). While you only sporadically glimpse LaBeouf, Rönkkö, and Turner when the lift doors open, you’re able to listen to the audio from inside the lift, and it’s strangely compelling. What emerges from it is a sense that no one really knows quite what to say to a celebrity when they encounter one ­– let alone when they’re trapped in a confined space. It’s an oddly surreal insight into whats it must be like to be famous, and one which made me glad that I’m not a celebrity – you imagine it would be quite isolating. I’ve been watching this for a while and at parts it’s almost painful to watch. At one point a bunch of university rugby bros kitted out in their college sports kit laugh sycophantically at everything Shia says with that deep-throated guffaw only an expensive public school education can bring you. I actually had to turn the audio off at this point – I thought my days of having to listen to braying rugby bros were behind me when I left uni, but apparently not. LaBeouf has been interrogating the idea of celebrity through his performance pieces for a number of years now. Recent project #TOUCHMYSOUL asked members of the public to ring Shia on the phone, while his #IAMSORRY installation questioned what happens when people who worship the cult of celebrity react when confronted with with a real-life celebrity in person. Randomly, people Russia seems to be going absolutely crazy for the live feed, with the majority of people commenting on the thread doing so in Russian. Check it out below.